Separamadu Lasith Malinga, (Sinhalese: සපරමාදු ලසිත් මාලිංග born 28 August 1983) is a professional Sri Lankan cricketer and former ODI and T20I captain for Sri Lanka. Considered as one of the greatest fast bowlers ever in world cricket, Malinga has perfected the lethal dipping yorkers and slow ball yorkers with his slinging action. He is a specialist fast bowler with a unique round-arm action, sometimes referred to as a sling action, which leads to his nickname, "Slinga Malinga" and conversely, his bowling style being nicknamed "Malinga the Slinga" both terms still consistently being associated with him in street cricket and general cricketing society. He is known for his ability to take consecutive wickets, with in-swinging deadly yorkers: he is the only bowler in the world to have two World Cup hat-tricks, the only bowler to have taken three hat-tricks in ODIs and the only player to have taken four wickets in four consecutive balls in any form of international cricket. On 22 April 2011, he announced his retirement from Test cricket. He bowls at around a speed of 140 km/h (87 mph). He is the second highest wicket taker in all Twenty20 International cricket just after Shahid Afridi and highest wicket taker for Sri Lanka in Twenty20 Internationals as well. Malinga was the captain of the Sri Lankan cricket team that won the 2014 ICC World Twenty20 and was part of the team that made the final of 2007 Cricket World Cup, 2011 Cricket World Cup, 2009 ICC World Twenty20 and 2012 ICC World Twenty20. He was the captain of Twenty20 International side for Sri Lanka, until 7 March 2016, where Malinga stepped down from captaincy due to his continuous injuries. Malinga grew up in modest circumstances in Rathgama, a coastal village situated 12 km northwest of Galle. He often played cricket with friends on the sand banks and coconut groves by a river in his cricket-obsessed village. He had his education at three schools, namely Mahinda College, Galle, Vidyaloka College, Galle and Vidyathilake Vidyalaya, Thiranagama. Malinga had his primary education at Vidyathilake Vidyalaya in Thiranagama, a school situated near by his village. After passing the grade 5 Scholarship Examination in 1993, he entered Vidyaloka College, Galle for his secondary education, where he started his cricket career. Here Malinga was discovered by former Sri Lankan paceman Champaka Ramanayake. Champaka, so impressed by Malinga's raw ability, invited him to join the Galle Cricket Club. Champaka also helped him to join the first XI cricket team of Mahinda College, Galle.Joining Mahinda College was the turning point of his cricket career and he was helped by some of its distinguished Old boys. A short-lived attempt to make Malinga's action more upright led to much reduced pace and failing accuracy. 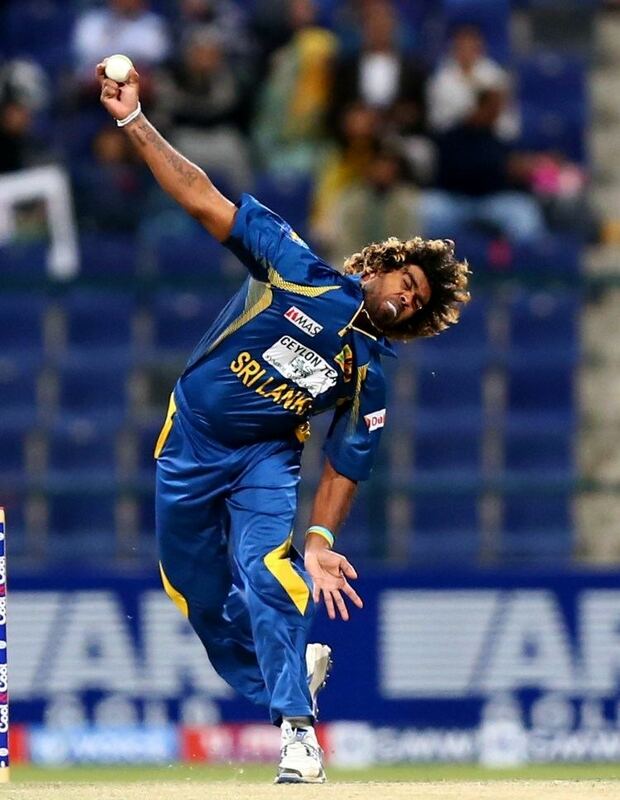 Malinga promptly returned to his natural action with success, and with great encouragement from Ramanayake. Malinga's action has attracted great comment. The cricket reference text Wisden has noted that Malinga's delivery action is similar to "slinging". 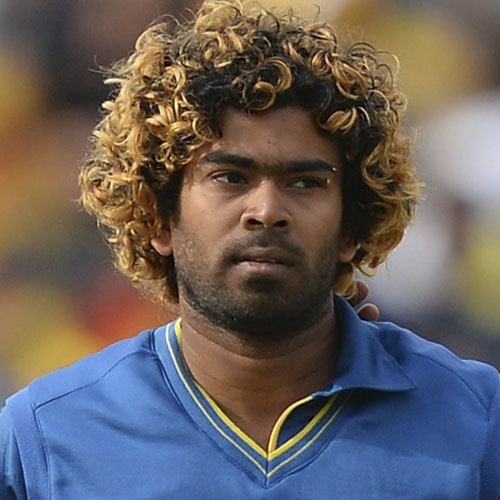 Resulting to his nickname "Slinga Malinga". Malinga has said that his unique round-arm bowling action was a result of learning to play cricket exclusively with a tennis ball. Typically, younger bowlers are encouraged to deliver the ball with their arm near vertical to remove or reduce direction variables. Sir Viv Richards admired Lasith Malinga's impressive bowling during the 2007 Cricket World Cup which was held in Caribbean, saying that Lasith Malinga is the best thing that happened to Sri Lankan cricket after Aravinda de Silva. Malinga made his Test debut on 1 July 2004 against Australia at Marrara Oval In Darwin. He was immediately successful, taking six wickets in the match (Darren Lehmann twice, Adam Gilchrist, Damien Martyn, Shane Warne and Michael Kasprowicz) He was impressed by the friendliness of the Australian team in general, and in particular Adam Gilchrist who sought him out after the game to present him with one of the match stumps in the Sri Lankan dressing room. He developed into Sri Lanka's fastest Test bowler and a regular member of both their Test and One Day International sides. He has earned a reputation for troubling batsmen with his lively pace and well-directed bouncer. He regularly bowls at speeds between 140 and 150 km/h (87 to 93 mph) and sometimes slightly faster. As time went by he started to lose pace clocking around 130 to 140 km/h. His slower off cutter was also menacing. He burst onto the test scene after ripping through the New Zealand top order, helping Sri Lanka draw the test series on their 2006/07 tour of New Zealand. He announced his retirement from Test cricket on 22 April 2011 in order to prolong his career in ODI and T20 cricket. Malinga made his ODI debut in Sri Lanka's opening match of the 2004 Asia Cup against the United Arab Emirates, becoming the 123rd player to do so. Easily winning the match by 116 runs, Malinga took the wicket of the Emirati captain, Khurram Khan to the finish the match with figures of 1/39. Since then he has become a regular member on the ODI squad. During the 2007 Cricket World Cup Super 8 match on 28 March between Sri Lanka and South Africa, Malinga became the first player to take four wickets in four consecutive balls in One Day International cricket. Needing five runs for victory and with five wickets in hand, Malinga was handed the ball in the 45th over of the South African's innings. In the final two balls of the over he cleaned bowled Shaun Pollock and had Andrew Hall caught at cover. In his next over, he removed Jacques Kallis caught behind then bowled Makhaya Ntini. This was only the fifth hat-trick in World Cup history, the third ODI hat-trick for Sri Lanka and the 24th overall in ODIs. He nearly took the final wicket as a ball shaved the stumps. Despite Malinga's lethal spell, however, South Africa proceeded to win the match by 1 wicket with 10 balls still left. During the 2011 Cricket World Cup, Malinga took his second career hat-trick in Sri Lanka's group stage match against Kenya. This made him the first bowler to take two World Cup hat-tricks, and the fourth to take two hat-tricks in all One Day International cricket (alongside Wasim Akram, Saqlain Mushtaq and Chaminda Vaas). In August 2011, he managed yet another hat-trick, against Australia, to become the first man to take three hat-tricks in ODI cricket. Malinga took 7 five-wicket hauls in ODI cricket and reached 280 plus ODI wickets currently. He has been named as the official event ambassador for the World Twenty20 Championships by ICC. Malinga was named as the vice-captain of the Sri Lankan Twenty20 International team in October 2012. He became captain of Sri Lankan Cricket Team in 2014 ICC World Twenty20 after Dinesh Chandimal received a ban. He successfully led the team to win the world cup becoming the first Sri Lankan captain to win the ICC World Twenty20. He is the highest wicket-taker for Sri Lanka in T20Is with 80 wickets. After West Indies tour, Malinga suffered by back injury and a knee injury. With this, he did not participate to both New Zealand tour and India tour, hoping that he will recover when 2016 ICC World Twenty20 begins. However, Malinga was appointed as the captain for 2016 Asia Cup, where he was only able to play against UAE, with a match-winning bowling performance. The knee injury backed up him in the next matches and Sri Lanka lost all matches due to absence of Malinga in the team. Sri Lanka announced his World T20 team with Malinga as the captain, but continuous injuries results Malinga to stepped down from captaincy and Angelo Mathews has been named as the captain in all formats. Even though Sri Lanka felt that Malinga will recover for the World cup matches, his injury results him to ruled out of the Twenty20 squad. He returned home due to prevailing bone bruise on his left knee. Malinga quit from all domestic and international cricket for a one-year after his T20I match against UAE in March 2016. Due to these injuries, Malinga lost matches against England, Australia, and Zimbabwe Tri-series, where Sri Lanka involved heavy defeats in limited over cricket and went down in international rankings. Though he recovered from injuries in late December, Malinga was unavailable to South Africa series after a bout of dengue. 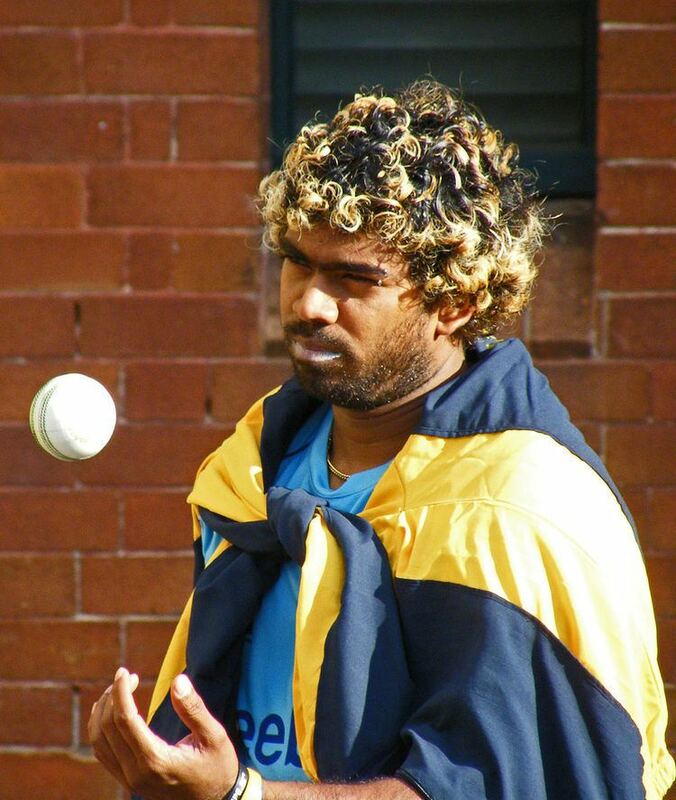 Malinga was picked up to the Australian tour and played in the match against Prime Minister's XI. His comeback match came against Australia on 17 February 2017, where he took two wickets and two catches. Sri Lanka won the match by 5 wickets at the end. On 6 April 2017, during second T20I against Bangladesh, Malinga took a hatrick, becoming the second Sri Lankan and fifth overall to took T20I hatrick. With that, Malinga has taken 4 international hatricks, which is most by a Sri Lankan player and joint highest with Pakistani Wasim Akram. Malinga was included to the ODI squad for 2017 ICC Champions Trophy in June 2017. He played his comeback match against South Africa on 3 June 2017 at the pool match of Champions Trophy. However his comeback was not good at all, where he finished the spell wicket less by giving 57 runs and put down a catch and was sloppy in the fielding as well. Sri Lanka suffered a heavy loss in the match by 96 runs finally. During the Indian ODI series, captain Upul Tharanga was suspended two ODIs due to slow over rate. Therefore, Chamara Kapugedera was appointed as the stand-in captain of those two ODIs. However, he aggravated a back injury during the third ODI and ruled out of the series. For the fourth ODI, Malinga was appointed stand-in captain. In the match, Malinga took his 300th ODI wicket by dismissing Virat Kohli. Despite his milestone, India scored 375 runs and Sri Lanka only managed to score 207 runs and lost the series 4–0. Malinga plays for Indian Premier League (IPL) team Mumbai Indians. He is their strike bowler in this format and is a leading bowler in the competition. World record holder Sachin Tendulkar and ex-Mumbai Indians captain described Malinga as an important cog in the Mumbai Indians game plan after the retirement of strike bowler and captain Shaun Pollock, who represented the team in the first season. In the first match for the Mumbai Indians in the fourth season, he got 57744 wickets against Delhi Daredevils, restricting them to a mere 95. His best bowling figures ever is 6/7 for Melbourne Stars against Perth Scorchers in December 2012, the only six-wicket haul taken the Australian Big Bash League. He won the Purple Cap award (most wickets) in the fourth season of Indian Premier League with 28 scalps in 16 matches. Throughout the tournament, he led the Mumbai Indians attack from the front and was instrumental in many victories. Lasith Malinga has chosen Mumbai Indians over Southern Express in the CLT20 cricket tournament, scheduled to be played in September. In the 2011 Champions League Twenty20, he was the highest wicket taker in the tournament and won the golden wicket for this performance and won the award for the player of the tournament. Malinga also hit a lot of runs. Only bowler in cricketing history to take four wickets in four consecutive balls in international cricket (vs. South Africa March 2007). The first and, to date, only bowler in cricketing history to take three hat-tricks in One Day International cricket, taking his third in August 2011. Lasith Malinga and Angelo Mathews hold the highest run partnership for the 9th wicket in an ODI: 132 runs, against Australia in Melbourne in 2010. Malinga scored 56 Runs from 48 balls including six fours and two sixes; Mathews scored 77 runs off 84 deliveries including eight fours and one six. His 56 is the fourth highest ODI score by a number 10 batsman in ODI history and he has the record for the highest ODI score for Sri Lanka when batting at number 10 position (56),he too is the only Sri Lankan to score a fifty in no 10 position in an ODI. He is the only bowler with two World Cup hat tricks, against South Africa in the 2007 Cricket World Cup and the other against Kenya in the 2011 Cricket World Cup. Best Twenty20 figures in Australian domestic and 2nd in the world. As of April 2017, Malinga with 317 wickets in 232 games is the second highest wicket-taker in all Twenty20 matches. Malinga holds highest number of wickets (149) in Indian Premier League. As of 19 January 2017, Malinga still holds the best figures in BBL history with 6/7. Fourth Sri Lankan to achieve 300 ODI wickets, after Muralitharan, Vaas and Jayasuriya. He is the fifth quickest bowler to reach the landmark (203 matches).